There are 2 types of mobile home parks. 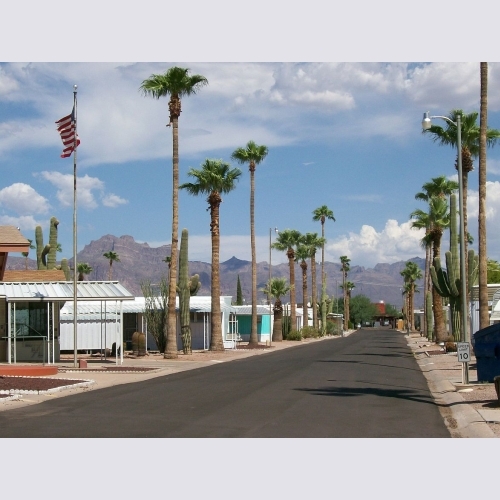 The most typical mobile home park is called a land leased park or community. The second type is a share owned or land owned mobile home park. In a land leased mobile home park an individual may own or rent the mobile home, but they lease the land. That means they pay lot rent. Most mobile home park lot rents are paid monthly. The owner of the mobile home park usually includes some amenities in that fee. There may be a park manager, maintenance crew, clubhouse, pool, playground, tennis courts, etc. Some parks may include water and sewer, trash pickup, and other utilities in the monthly rent. Higher lot rents usually indicate more upscale amenities, such as golf courses, lakes, restaurants, theatres, and more. The more upscale parks usually prefer to be called Manufactured Home Communities, rather than mobile home parks or trailer parks. They are often gated communities and may have special security measures and strict rules and regulations for the good of all the residents. A share owned, or land owned mobile home park means that the residents own the park and they share all of the expenses. They also pay property taxes, just like other property owners. Because they share ownership, they are much like condo owners. Each resident has voting rights and there is a board of directors that makes and enforces rules and oversees financial matters. Because of that, the monthly maintenance fee is usually much less expensive than in a land leased community. Share owned mobile home parks may be upscale or more low key. The fewer amenities offered, the less expense for the owners. Most, however, have basic services such as a pool, clubhouse and activities. Many people like the idea of a share owned mobile home park because they feel more secure knowing that the park will not be sold. Offsetting that advantage is the initial mobile home cost, which is considerably higher because of the land.